Using analytical aberration-corrected scanning transmission electron microscopy (STEM), we studied the behavior of the electron probe propagating in SrTiO3 at sub-atomic length scales. For the very first time, we discovered the unusual nature of sub-atomic beam channeling in crystalline material. In some cases electrons of the probe channel along the atomic column with pendulum-like motion, moving side-to-side inside the atoms. In the other cases, they spiral within the atoms forming a helicon-type beam. In the figure, the position of the peak intensity of the propagating beam (in unit cells, u.c.) located near the oxygen atomic column is shown for these two cases. This discovery suggests that there is a rich sub-atomic science to be explored using these beams. Atomic-scale magnetism is one field that can benefit dramatically from this discovery of spiraling electron beams in crystals. Electrical control of magnetism is a long sought-after goal in the field of spintronics, potentially enabling completely new approaches to energy-efficient memory and logic chips for computers. In IRG-1, researchers are addressing this challenge by applying an emerging approach termed “electrolyte gating” to control magnetic properties simply by application of a voltage. The most recent development is successful implementation of a theoretical idea to enable large tunability in Curie temperature, i.e., the temperature at which magnetism turns on. In essence, by electrically connecting nanoscale magnetic clusters that already exist in compounds known as magnetic perovskite oxides, an anomalously large change in Curie temperature was obtained, up to 150 degrees with 4 volts, setting new records in the field. The effect is electrostatic, not involving motion of ions in the oxides, potentially maximizing switching speed, which is important for applications. 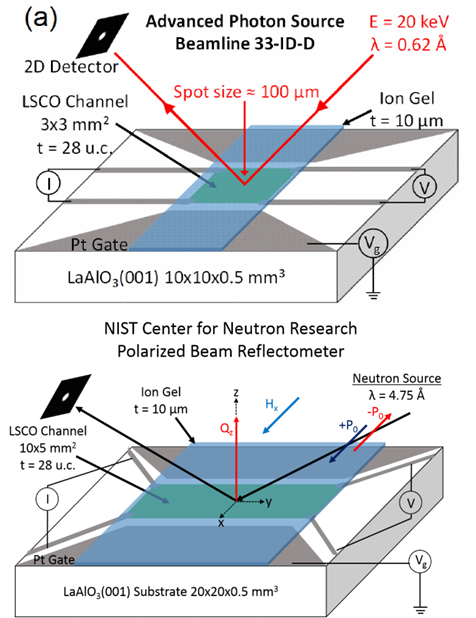 In a collaboration with Oak Ridge National Lab, scattering of neutrons was additionally used to directly verify the voltage-induced magnetism. The result is an important step in the development of electrically-tunable magnets, with substantial implications for next-generation computing paradigms. Precise control over defects in materials is often a highly effective means to control properties and function. In oxide materials, which are the focus of enormous current attention for many existing and proposed applications, defects known as oxygen vacancies often play the key role. These vacancies, simply missing oxygen atoms in the structure, can have a significant impact on properties. 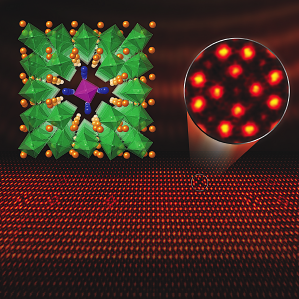 Recent work by investigators in IRG-1 has shown that in a specific type of oxide (perovskite cobaltite films) oxygen vacancies can not only be created, but also controlled to form ordered patterns, in turn controlling electronic and magnetic properties. In this work, state-of-the-art capabilities in IRG-2 with measurement of thermal conductivity in nanoscale materials was used to measure the impact of this defect formation and ordering on the flow of heat. Surprisingly, the thermal conductivity in such materials was found to be extremely low, comparable to glasses, some of the best thermal insulators known. The finding that thermal insulation of this type can be obtained even in highly ordered crystalline materials has significant potential implications in heat management in devices. One of the major concepts under exploration in IRG-1 in the U. of MN MRSEC is “electrolyte gating”, a highly promising potential means to electrically control materials properties. One of the difficulties in obtaining full understanding of the operating mechanisms in electrolyte-gated devices is characterizing them “in operando”, i.e., as they are actually functioning. Recent work in the IRG has made a breakthrough in this regard by establishing not one, but two, effective means to achieve this. Large-scale national facilities have been used to probe working devices using high energy X-rays and polarized neutrons, providing vital information on mechanisms. In particular, the devices are found to operate completely differently for different signs of the electrical voltage, a major advance in terms of resolving the ongoing debate surrounding mechanisms in this exciting technology. Electrically conductive networks of semiconductor nanocrystals (NCs) are needed for a variety of optoelectronic devices. The small size of the nanocrystals gives rise to valuable new properties such as tunable light absorption. However, most semiconductor NC networks are poor conductors of electricity (“insulators”). In this work we explore the possibility of transforming such a network into a good conductor (“metal”) by applying intense pulsed light (IPL). We find that IPL improves conductivity in two ways: it increases both the interparticle contact area as well as the number of free electrons. Tuning both parameters, we observe electrical behavior indicative of close proximity to the insulator-metal transition. This allows us to evaluate the insulator-metal transition criterion predicted by Kortshagen and Shklovskii (Nature Materials., 2016) and to formulate strategies for obtaining truly metallic behavior. This study was reported in Nano Letters. Black phosphorus (BP) has emerged as a direct-bandgap semiconducting material with great application potentials in electronics, photonics, and energy conversion. Experimental characterization of the anisotropic thermal properties of BP that are micrometers in size is extremely challenging. One difficulty comes from the challenge in synthesizing large-size high-quality BP crystals. Another impediment stems from the lack of reliable and accurate experimental techniques to measure the anisotropic thermal properties of thin-film samples. 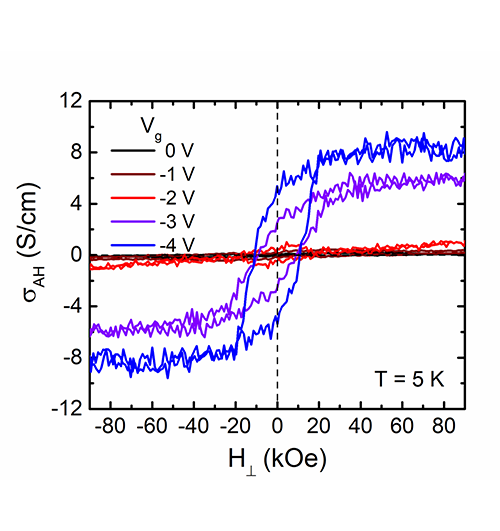 In this work, we synthesize large-size high-quality BP crystals and employ a novel technique of time-resolved magneto-optical Kerr effect (TR-MOKE) to study their intrinsic anisotropic thermal conductivities along three primary crystalline orientations. This work reveals the origins of the anisotropic thermal transport in BP, as demonstrated by the excellent agreement between measurement results and first-principles calculations. 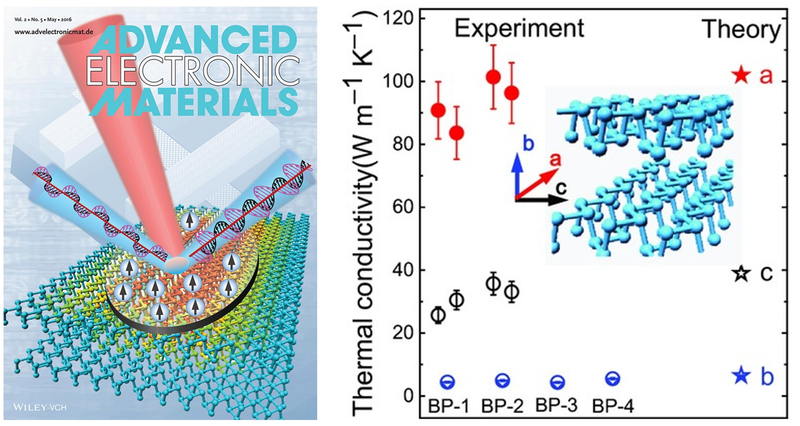 This collaborative work between two PIs of IRG-2: Xiaojia Wang (ME) and Stephen Campbell (ECE) has been featured as the cover image of Advanced Electronic Materials. Methyl cellulose (MC) is a widely used plant derived polymer with a unique property – at high temperatures in aqueous solutions the chains self assemble into fibrillar networks. The radius of the fibrils is remarkably uniform and is likely set by the persistence length (lp) of the MC chains. To test this hypothesis, we have systematically grafted 800 and 2000 g/mol poly(ethylene glycol) chains onto the backbone of MC using thiol-ene click chemistry, with grafting densities (σ) from 0.07 –- 0.33 (PEG molecules per anhydroglucose repeat unit). Light scattering reveals that at room temperature grafts effectively stiffen the chain, increasing both the overall radius and the persistence length of the MC backbone. In the most extreme case of highly grafted 2000 g/mol PEG, lp increases by an order of magnitude. This finding agrees with theoretical predictions exceptionally well, and provides a systematic approach to increasing MC chain stiffness. The ability to precisely predict how molecular structure influences the microstructure of polymeric materials is the key towards the custom tailoring of desirable materials properties. Molecular dynamics simulations with atomistic level models were performed to design “high-χ” block oligomers that can self-assemble into 1-5 nm domains for next generation microelectronics applications. Simulations show that the microstructures formed by these oligomers can be tuned by varying the molecular weight and the chain architecture. The results are being used to guide the synthesis of block oligomers for desired microstructural morphologies and domain periods. In particular, these results open a path to significantly smaller features than previously obtained by block polymer self-assembly. The versatility of polyelectrolyte complexes resides in the facile incorporation of multiple chemical components in the composing polyions, which allows design of complexes with intricate structures and multiple functionalities. In this work, the complexation of ABC micelles with a model semiflexible polyion, DNA, is systematically investigated to correlate the structure of the micelle with the properties of the resulting “micelleplexes”. 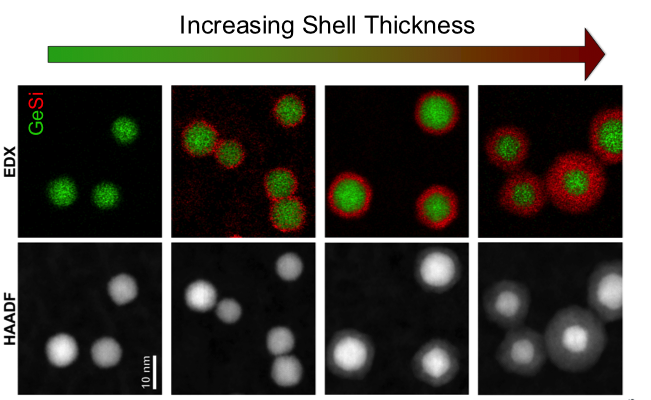 With the addition of a nonionic outer corona, the colloidal stability of the resulting micelleplexes dramatically improves and is maintained over a wide range of charge ratios. At the same time, the size, composition and structure of micelleplexes can be tuned by varying the nonionic outer corona length without compromising the colloidal stability. These results demonstrate a new strategy to compact long chain polyions and design nanoparticles with superior colloidal stability and tunable composition. Everyday optical waveplates used for polarization control of scattered light rely on bulky birefringent materials. Our goal is to realize such functionality on an atomic scale with the effect also being electrically tunable. To achieve this, we are exploring the use of plasmons in a highly anisotropic two-dimensional material called “black phosphorus” to realize an extreme form of birefringence. 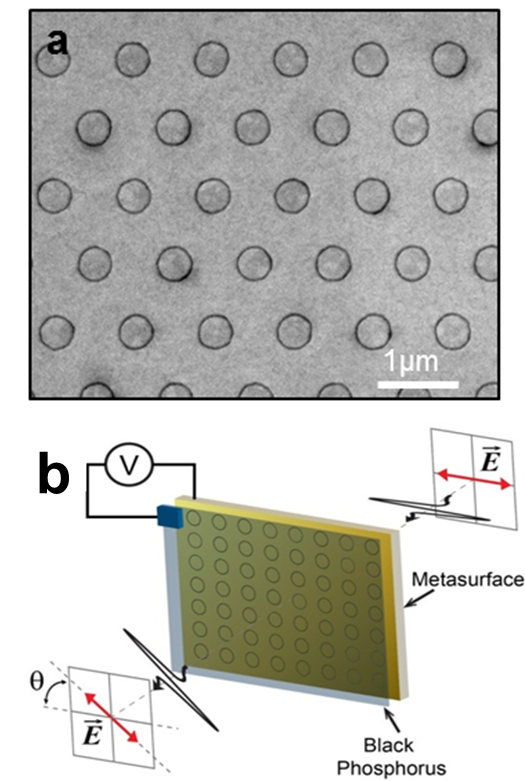 We predict that metasurfaces exploiting such anisotropic plasmons could lead to arbitrary control of the polarization of reflected light, including polarization rotation and conversion in the mid-infrared regime, and could have applications in displays and imagers. 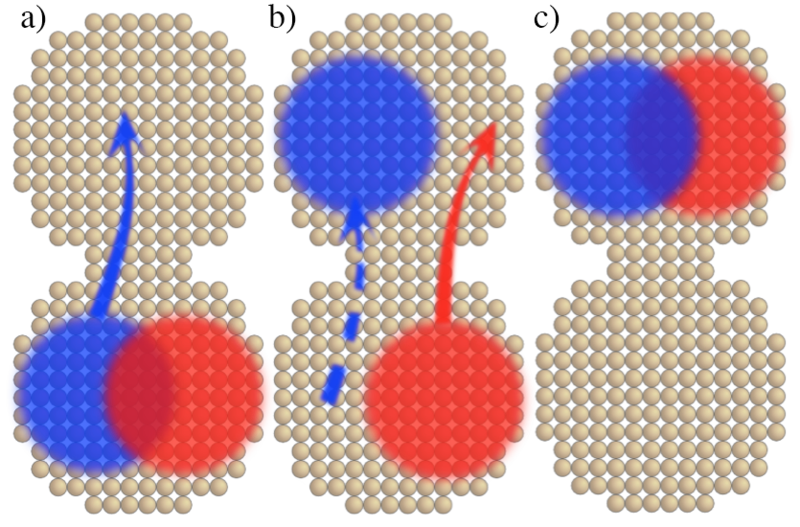 Through unique atomic layer deposition techniques (Figure a), we are building an experimental platform for realizing polarization control with only atomic thin materials (Figure b). About the figure: Top: Group Photo of 2017 workshop participants; Bottom: RET participant and workshop instructor, Cassie Knutson (center) demonstrating workshop lab activities. 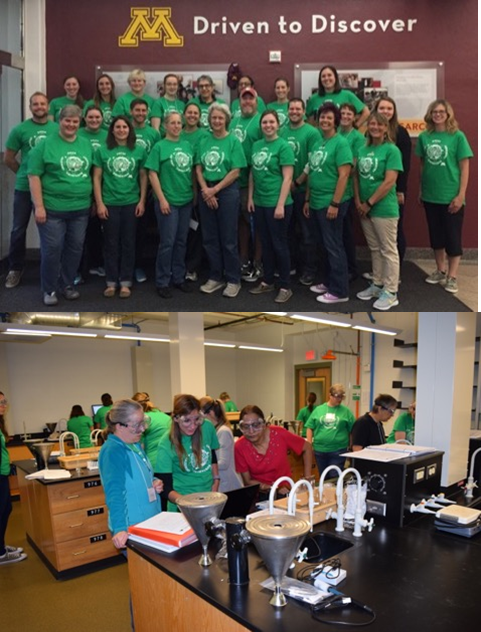 The Green and Sustainable Chemistry workshop was created in 2017 to share the research and curriculum developed by UMN MRSEC RET participants and help ensure RET activities reach a larger student audience. In its inaugural year, 20 high school teachers completed the three-day workshop. During the workshop, teachers learned three separate lab activities designed to incorporate materials science and engineering concepts into the high school chemistry classroom. All three activities meet Next Generation Science Standards in engineering. Teachers who completed the workshop were provided with all materials necessary to implement the new lab activities in their classrooms – removing a significant barrier to the introduction of new class activities. About the figure: (Left) Comparison of solubility parameter differences determined from scattering experiments and calculated from molecular simulations: polypropylene (PP), head-to-head polypropylene (hhPP), and poly(ethylene-alt-propylene) (PEP). (Right) Snapshot of PP (red) and hhPP (blue) blend. The versatility of polymeric materials is inherent in their rich and varied molecular building blocks and architectures. The ability to quantitatively model polymer systems on the molecular level provides a route to engineer polymeric materials with desired properties. In this work, we utilize Monte Carlo simulations and transferable force fields to study the thermodynamic and structural properties of some olefin oligomers. 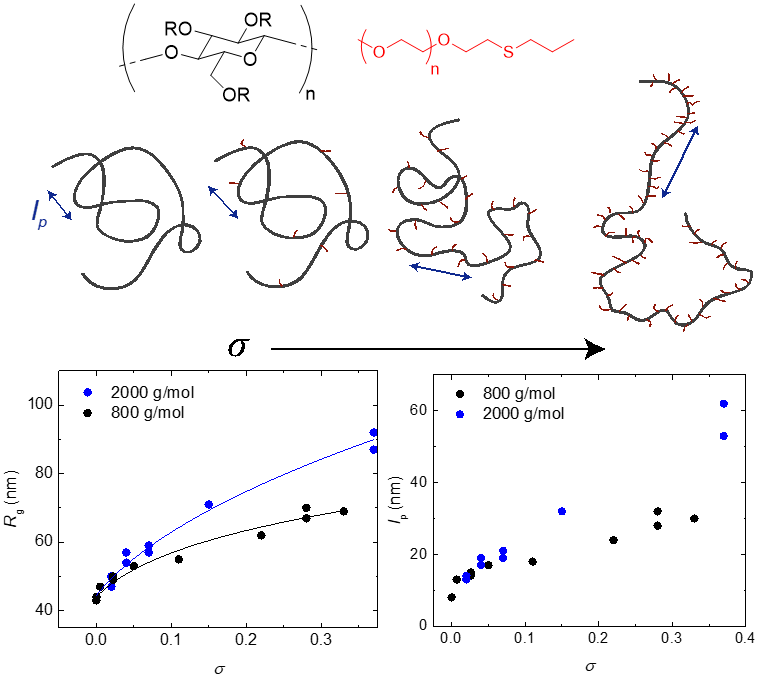 It is shown that extrapolation of data for short oligomers can reproduce important thermodynamic properties of the polymers. In addition, the Flory−Huggins χ parameters, a measure of the unlike bead-bead interactions, are calculated directly from simulations of binary mixtures. The binary oligomer blend of propylene isomers is found to exhibit stabilized irregular mixing behavior, in agreement with experiments for polymers. Our results identify molecular simulations as a promising approach to predict and understand the polymer phase behavior. A significant challenge facing the development of polyelectrolyte complexes for biomedical and materials applications is kinetic trapping of the complexes far from their equilibrium states. 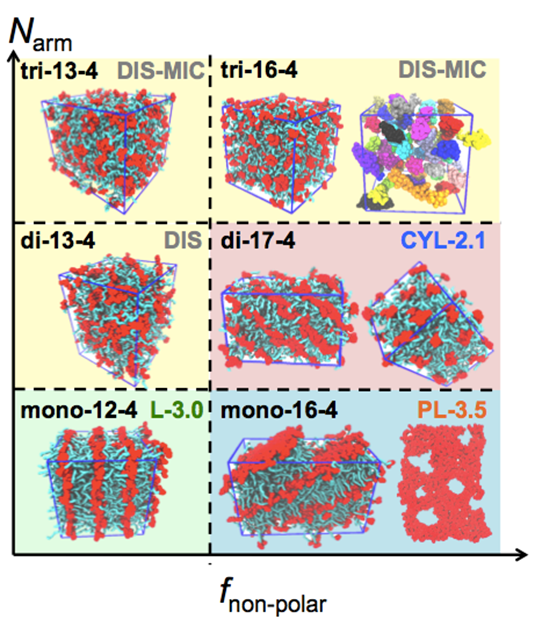 Recent work from IRG-3 demonstrates that controlling the charge density of the polyelectrolyte chains can help promote rapid equilibration of these complexes. 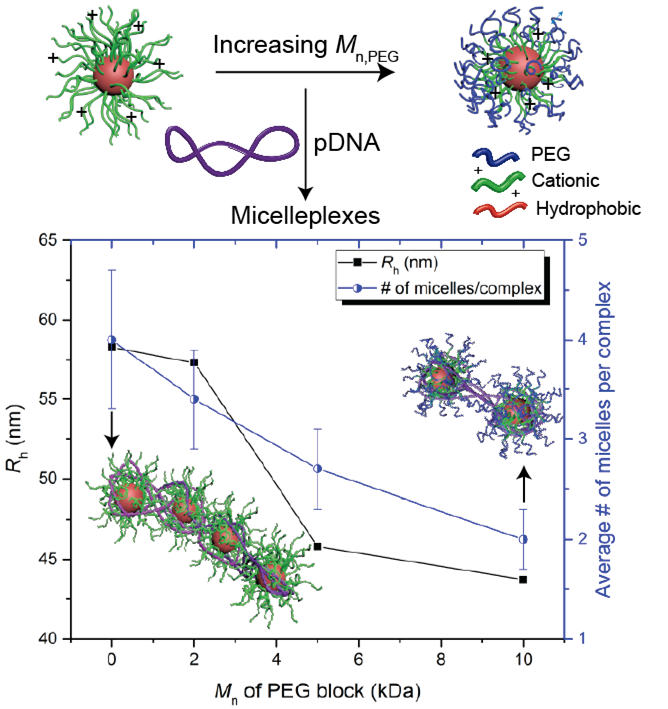 Through experiments on complexes of polyelectrolyte micelles, researchers in IRG-3 showed that incorporation of neutral, uncharged monomers facilitates rapid rearrangement from insoluble multi-micelle aggregates to soluble single-micelle complexes. Molecular dynamics simulations on model polymer brushes demonstrated that this results from the energy required to break ion-ion contacts in polymers with alternating charged and neutral units being lower than in polymers with many adjacent charges. These results provide critical new information for applications requiring rapid equilibration followed by long-term stability. 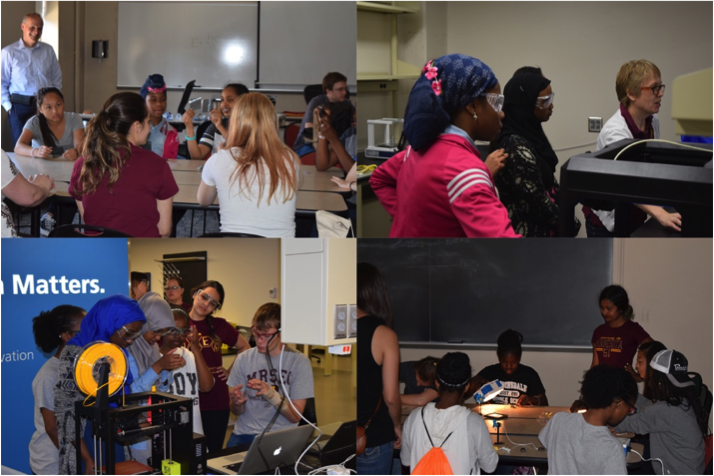 In 2016, the MRSEC broadened the reach of its popular Materials Week program by presenting hands-on demonstrations and lab activities for 30 Middle School girls participating in the Eureka! program. Eureka! is a partnership between UMN and the MPLS YWCA to encourage participation in STEM by providing opportunities to girls beginning in 7th grade and supporting them continuously through high school graduation. The MRSEC Materials Week program began as a weeklong summer camp for high school students but has since grown to include students as young as 7th grade. The library of activities developed for the program are now used is several MRSEC Education and Outreach programs and presented to nearly 300 middle and high school students each year. About the figure: Core/shell nanocrystals with increasing shell thickness as viewed by Scanning/Tunneling Electron Microscopy (STEM) (bottom) and Energy Dispersive X-ray Spectroscopy elemental (top). Shells of increasing thickness are grown by increasing the concentration of silane (SiH4) in the shell gas feed. Nanoparticles, consisting of only a few hundred to a few thousand atoms, are of interest as building blocks for bottom-up processing or next generation electronics. Because they are so small, a significant fraction of the atoms that make up these materials are found at the surface. Consequently, these surface atoms are extremely important in determining the properties and stability of the nanomaterial. In this work, the researchers demonstrated the ability to grow nanoparticles with a shell of a different material, all in the gas-phase using a plasma. This process allowed them to make core/shell nanocrystals that required high temperatures for synthesis that would be difficult or impossible to achieve in solution. They demonstrated the process by synthesizing germanium nanocrystals (<10 nm) with a silicon shell produced using a novel nonthermal plasma reactor design (K. Hunter, U. Kortshagen; Department of Mechanical Engineering). In collaboration with colleagues in the Department of Chemical Engineering and Material Science (J. Held, A. Mkhoyan), the core/shell structure of these nanocrystals was confirmed by scanning tunneling electron microscopy (STEM). Through careful analysis of these STEM images, the researchers were able to correlate the change in the properties of these particles with increasing shell thickness. The ability to use gas-phase processes to create nanoparticles with a core/shell structure opens up the possibility to produce nanomaterials that have so far been inaccessible by other approached. This study was reported in the journal ACS Applied Materials and Interfaces. A new concept being developed in MRSEC IRG-1 at UMN allows for external electrical control over the electronic and magnetic properties of materials. This is based on the use of electrolytes in transistor devices, using electrical voltage to inject electrons into material surfaces, thereby controlling their properties. 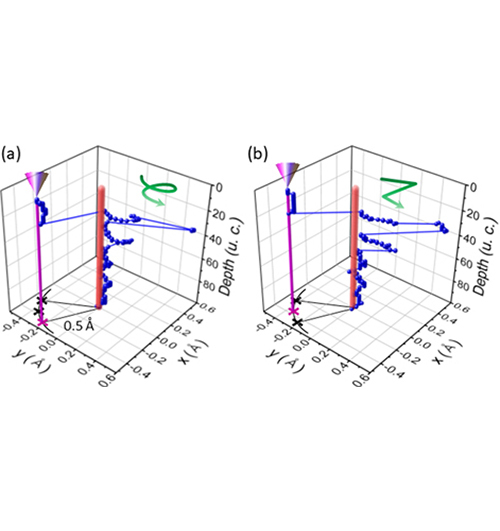 In this work, researchers in IRGs 1 & 2 have studied this problem theoretically, making predictions about the surface electron density required to induce transitions from insulating to metallic, and from non-magnetic to magnetic. The latter proceeds by connecting together (“percolating”) isolated magnetic clusters, forming a full long-range magnet. This work predicts that even though the electrons are added only at the surface, the percolated magnetism can extend much deeper into the material than expected, an exciting prediction that is now being tested in experiments. Transistors, the building blocks of all computer technologies, are currently based on semi-conductors such as silicon, manufactured using energy-intensive processes. Materials that can be processed into electronic devices using cheaper and less energy-intensive methods are of high interest for a number of applications. 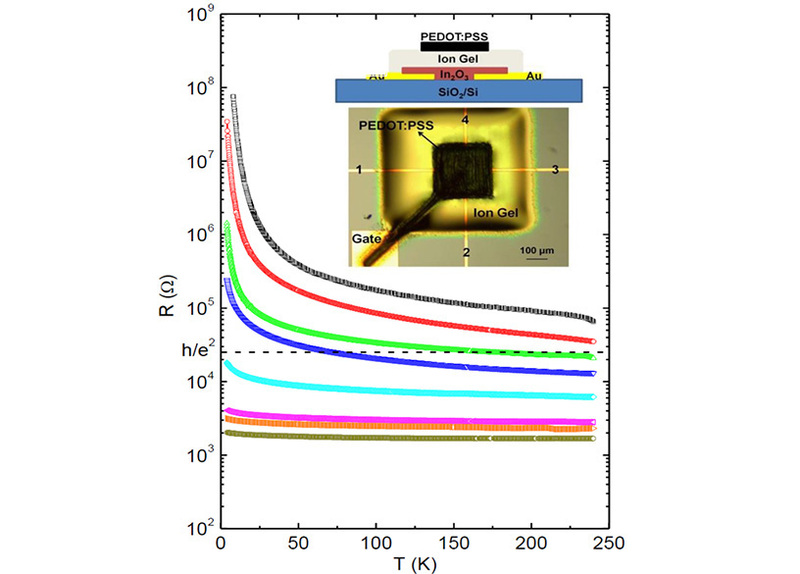 In work recently performed in IRG-1, UMN MRSEC researchers have demonstrated landmark performance in transistors based on the widely studied transparent semiconductor indium oxide, fabricated via solution processing. Solution processing is a low temperature, low cost approach (in this case essentially a form of inkjet printing), but was shown here to be capable, in conjunction with cutting-edge electrolyte dielectrics, of voltage-induced metallic behavior at interfaces. This metallic conductivity is important, as it maximizes current output, improving device performance and applicability. Defects, essentially locations in a crystal where the perfect arrangement of atoms is disturbed, are inherent in materials, and play a key role in their function. As they have been studied for so long, the discovery of new types of defects is rare. In recent work in IRGs 1 and 2 a completely new type of defect has been found in a class of complex oxide materials called perovskites, specifically the compound NdTiO3. This new defect is a “line” defect formed by a long local region of the crystal that rotates from the typical ordering pattern, as shown in the figure. This discovery was enabled by combining state-of-the-art synthesis methods with atomic resolution electron microscopy and complex computations, requiring collaboration between three MRSEC research groups with complementary expertise. One potential application lies in engineering such line defects to create atomic-scale “tunnels” for the flow of electrons or atoms. When a nanocrystal film absorbs a light quantum, its energy is stored in a nanocrystal exciton, which consists an electron and hole bound to each other by electrical attraction. The exciton hops between nanocrystals and, to release its electrical energy, should get converted into a free electron and hole before losing its energy. This is why it is important to increase the exciton hopping rate. The research team found a new fast mechanism of exciton hopping: first the electron moves from one nanocrystal to another and then the hole follows the electron. The research team showed that for touching semiconductor nanocrystals such hopping mechanism can be more effective than any other known mechanisms. This study was reported in ACS Nano. Energy in the form of heat impacts all technologies and plays a major role in the design and engineering of infrastructure. It is also the largest form of waste energy in critical applications, including power transmission and transportation. Scientists and engineers have spent decades researching how to control thermal energy at the atomic level in order to use it to do useful work and ultimately increase efficiencies and reduce the use of fossil fuels. However, no one has yet been able to directly image what thermal energy looks like or how it moves through materials in real time. This is because the basic length scales are billionths of a meter (nanometers) and the speeds can be many miles per second. Here, using a cutting-edge electron microscope, we were able to directly image the emergence and motion of exceedingly fast energy waves moving through semiconducting materials. Even more exciting was our observation that these energy waves interact with particular features in materials in ways that would have been impossible to determine with such certainty by any other means. These observations represent a breakthrough in our ability to study and understand how energy moves through materials and could potentially change the way we approach thermal-energy management. An important recent advance in the materials science of metal oxides is the discovery that interfaces between intrinsically non-conductive complex oxide materials can exhibit conductive behavior. This, and other advances, have led to the concept that “oxide electronics” could be developed, with functionality not possible in current devices. In this work, IRG-1 researchers, along with a SEED researcher and collaborators at the Pacific Northwest National Laboratory, have identified, for the first time, both the source of the electrons that conduct, and the means to control their number. In essence the interfacial electrons are controlled remotely (“by their tail”) by tuning the composition away from the interface. This is a significant advance in thin-film engineering of oxides, in that properties are controlled at the level of the individual atoms that make up the materials. Some of the materials used are only a single atomic layer thick, yet their properties can still be controlled. This discovery has several intriguing implications, including the possibility of new electronic and photonic devices. About the figure: Doping in solution vs. doping in plasma. Kortshagen, Aydil, Mkhoyan et al. Nano Lett. 2015, 15, 8162–8169. Doping – one of the central challenges of nanocrystal engineering – is essential for controlling the optical and electronic properties of compound semiconductor nanocrystals. Conventionally, these materials are synthesized and doped by solution-based methods, but a significant obstacle is often encountered: dopants are excluded during the early stages of nanocrystal formation and growth, resulting in undoped central cores and low doping efficiencies. 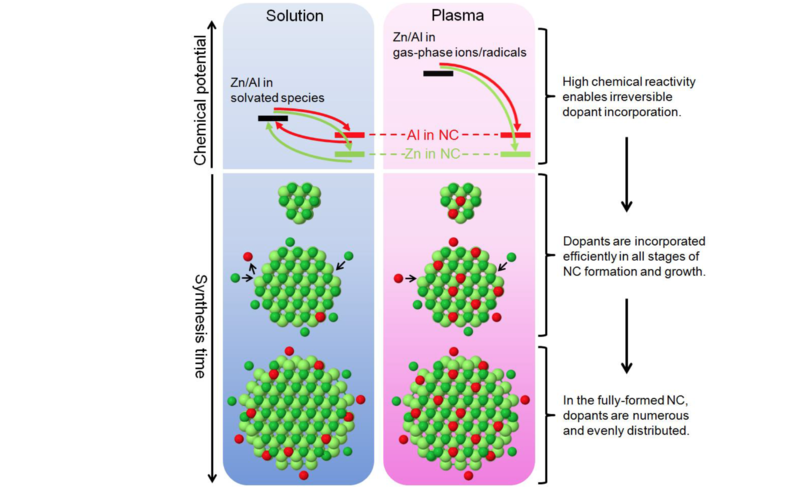 To address this problem, a team led by Professors Kortshagen, Aydil, and Mkhoyan developed a fundamentally different plasmabased process for synthesizing aluminum-doped zinc oxide nanocrystals, a prototypical material used in light-emitting diodes and solar cells. The key advantage of this approach was that the dopant Al atoms in the plasma were much more chemically reactive than their counterparts in solution-based synthesis. The team demonstrated that this high reactivity enabled irreversible dopant incorporation in all stages of nanocrystal growth, resulting in efficient and uniform doping throughout the nanocrystal cores. The ability to control the flow of electrons in semiconductor electronics depends on the presence of junctions between materials with different electronic energy levels. Traditional techniques for creating interfaces in semiconductor materials do not work well for monolayer, or two dimensional, materials. Instead, junctions in 2D materials are typically formed by stacking one material on top of another, forming a weakly bound, vertical stack through which electrons can flow. Researchers sponsored by the SEED program have recently developed a new method for forming atomically abrupt junctions in 2D materials. In their work, they used chemical vapor deposition to grow monolayers of semiconductor MoS2. By introducing molecular hydrogen into the reaction, they were able to control the shape and cleanliness of their MoS2 flakes. They then performed a second reaction to deposit another monolayer semiconductor, WS2. They were able to chemically control whether the second material grew on top of MoS2, as a vertical stack, or whether it grew around the MoS2 forming a covalent junction similar to junctions found in traditional semiconductors. The figure below displays a chemical model of the ideally abrupt interface, an SEM image of the monolayer flakes, and a TEM image confirming the atomically sharp interface. The abrupt, lateral chemical junction creates an abrupt electrical, p-n junction which could be used for optoelectronics such as solar cells and LEDs. Block polymers can produce high density nanostructured arrays by the attractive “bottom-up” strategy of self-assembly. Strongly segregated block polymers with low degree of polymerization are needed to prepare ultrahigh density features for emerging applications in microelectronics and high density magnetic data storage. A series of novel poly(cyclohexylethylene)-blockpoly( lactide) (PCHE-PLA) and poly(cyclohexylethylene)-block-poly-(ethylene oxide) (PCHEPEO) polymers have been synthesized to achieve ultra-small nanostructured arrays with sub-10 nm domain sizes. 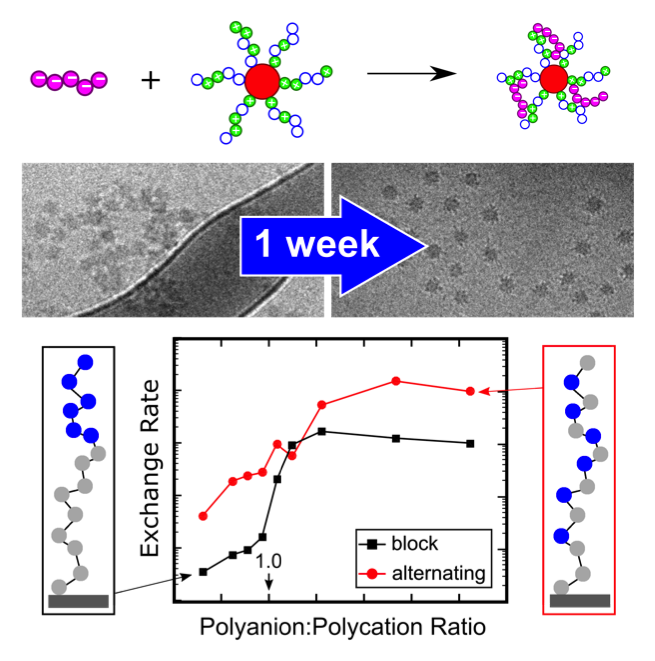 Ordered block polymers thin films with ultra-small hexagonally packed cylinders oriented perpendicularly were prepared by spin-coating and subsequent solvent vapor annealing for use in three distinct templating strategies. Selective hydrolytic degradation of the PLA domains generated nanoporous PCHE templates with an average pore diameter of 5 ± 1 nm. 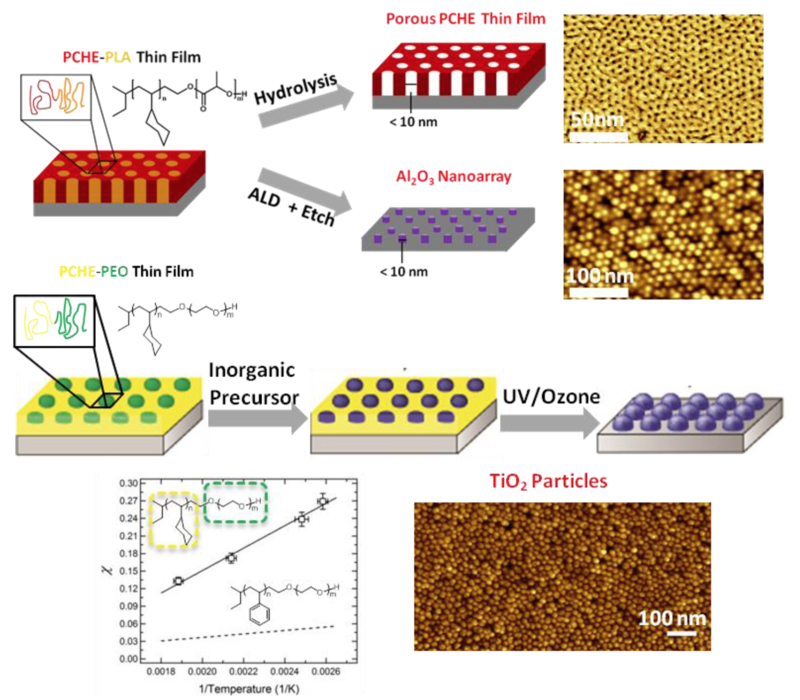 Alternatively, an Al2O3 nanoarray from the PCHE-PLA template was produced on diverse substrates including silicon and gold with feature diameters less than 10 nm. In a third approach, selective inclusion of inorganic precursor within the PEO domain enabled the formation of inorganic oxide nanodots with exceptionally small feature sizes of 6 ± 1 nm. How many electrons make a nanocrystal film metallic? About the figure: The metal-to-insulator transition in nanocrystal films occurs when the spatial spread of the electron wave function, described by the inverse Fermi vector kF-1, allows the electron to pass through a contact with diameter 2𝜌. The Fermi vector kF increases with the free electron density and the doping level. Measurements of the electron localization length ξ in phosphorous-doped silicon nanocrystal films support the theory, as they indicate the approach to the metal-to-insulator transition. The transition of a solid from an insulator to a metal as the number of free electrons in the material increases has been one of the central questions in semiconductor physics. In bulk semiconductors, this “metal-to-insulator transition” is described by the well-known Mott criterion. Understanding this transition in films of nanocrystals is of crucial importance to their future use in electronic devices such as light emitting diodes, solar cells, or transistors. An IRG-2 research team developed a new theory that relates the metal-to-insulator transition in films of doped nanocrystals to the “transparency” of the interface between nanocrystals for electrons. The theory predicts that the transition occurs under strikingly different conditions from those previously known for bulk semiconductors. In associated experimental studies of the electron conduction in phosphorousdoped silicon nanocrystal films, the team discovered a behavior that largely supports the predictions of the new theory. This study was reported in the journal Nature Materials. Glassy thermosets, such as epoxy, are brittle and lack the mechanical toughness needed for many applications. This work demonstrates that dispersing small amounts of nanoscale micelles of poly(ethylene-alt-propylene)-b-poly(ethyleneoxide) (OP) diblock copolymer (5 wt%) and amine modified graphene (GA) (0.04 wt%) to an epoxy results in an unprecedented 20-fold increase in the strain energy release rate (GIc), a measure of toughness. Remarkably, the improvement is multiplicative: graphene addition boosts the GIc of block copolymer modified epoxy by 1.8 times, the same increase noted for its addition to the neat epoxy material. Future work will focus on the underlying toughening mechanisms and the properties of composite coatings. High temperature superconductivity remains one of the biggest challenges in condensed matter physics. One of the major materials issues with high temperature superconductors is the difficulty of chemically doping materials such as complex copper oxides (cuprates) over a wide range of charge carrier densities. Recently developed methods using ionic liquids in devices called electric double layer transistors provide an elegant potential solution to this problem as they enable doping not chemically, but rather by applying an external electrical voltage. In this recent work in IRG-1, investigators have shown that this ionic liquid approach can be used to establish a special scaling relation between the superconducting penetration depth and transition temperature in cuprates, known as Homes scaling. 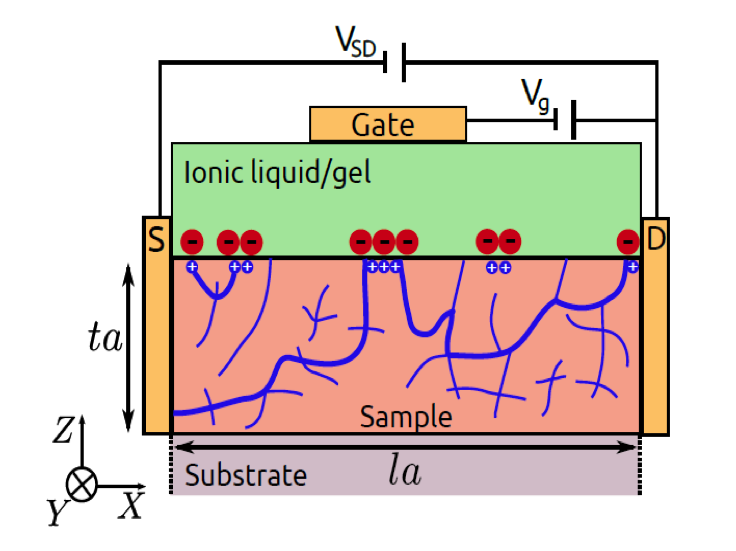 The ionic liquid gating approach is highly efficient compared to prior methods, the scaling being demonstrated in a single sample, tuned via an external parameter. Complex oxides are extraordinarily functional materials, and are promising for next generation “oxide electronic” devices. 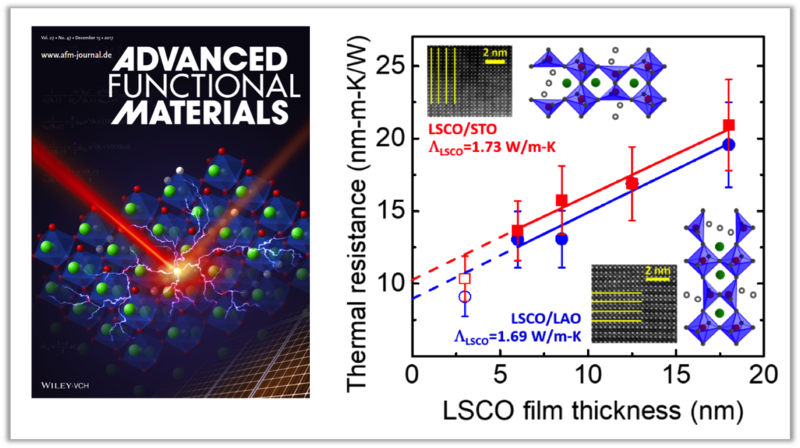 One particularly attractive direction with such materials is the formation of two-dimensional (2D) conductive layers at the interfaces between insulating complex oxides. In work recently performed in IRG-1 an exciting development with these interfaces has been uncovered, arrived at by working in collaboration with researchers in IRG-2 and at the Pacific Northwestern National Lab. 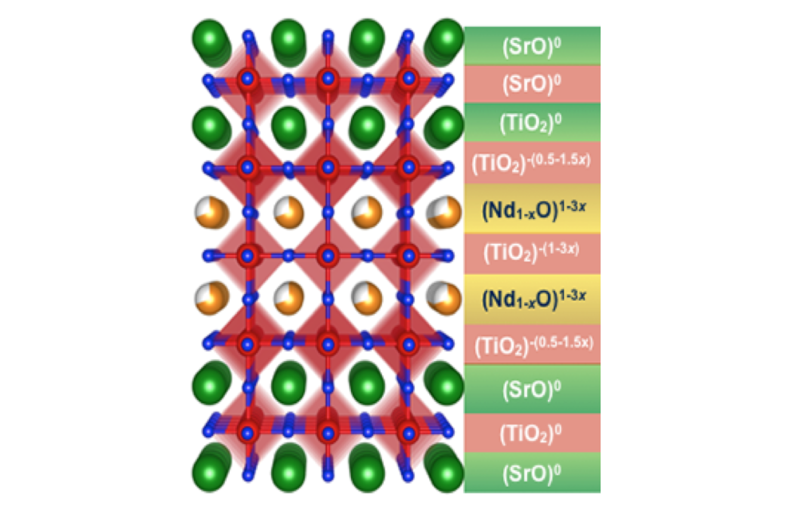 Specifically, the interface between the Mott insulator NdTiO3 and the band insulator SrTiO3 was shown to have an unusual energy band alignment that enables additional transfer of electrons from NdTiO3 to SrTiO3, thus creating an electron gas with almost ten times the electron density of standard interfaces. This phenomenon occurs at a critical thickness of the NdTiO3 layers, and is potentially externally controllable. The discovery has several intriguing implications, particularly for new photonic device concepts. In 2015, the University of Minnesota MRSEC expanded its American Indian Outreach activities with the inaugural American Indian Visit Day. 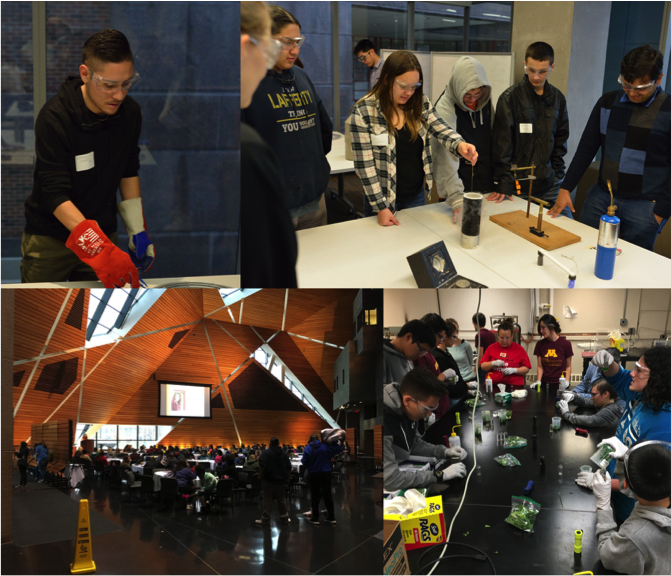 On November 7, 2015, 270 American Indian middle and high school students were invited to UMN for a day of activities to introduce opportunities in STEM available at UMN. The students participated in hands on activities presented by each of the three MRSEC IRGs exposing them to research in multiple science and engineering fields. Additionally, the students toured campus cultural offices and heard from American Indian student and alumni speakers. Students also participated in a college application workshop and were able submit applications to UMN on site at no cost. Complex oxides such as perovskites are extraordinarily functional materials, and are promising for next generation “oxide electronic” devices. A weakness of these materials, however, is that they support high electron mobility at cryogenic temperatures, but this is difficult to translate to room temperature operation. BaSnO3, an emerging material with record room temperature mobility is thus of high current interest. In work performed in IRG-1, researchers have now demonstrated an effective and simple approach to doping this material, simply by annealing it in vacuum to form oxygen vacancies. High electron densities are obtained, at mobilities competitive with, in some cases even higher than, other methods. This offers a number of potential advantages over other doping approaches, which require the deliberate introduction of impurities. The work could have impact in oxide electronics in general, as well as in transparent conductors for a variety of devices. Whether metallic behavior can exist in 2D materials is a question that has troubled condensed matter physics for decades. Although originally thought impossible, evidence for such in ultra-clean high-purity doped inorganic semiconductor heterostructures based on materials such as Si and GaAs eventually changed the prevailing view. Research performed in IRG-1 using an approach to doping known as electrolyte gating has now shown that highly conductive (close to metallic) behavior can also be seen in 2D in an organic semiconductor, rubrene. This was enabled by techniques, based on the use of ionic liquids, that increase the density of holes on the surface by a thousand times over prior work. The mobility of the holes in rubrene remains far lower than inorganic semiconductors, however, raising perplexing questions about the fundamental origin of the conductive state. 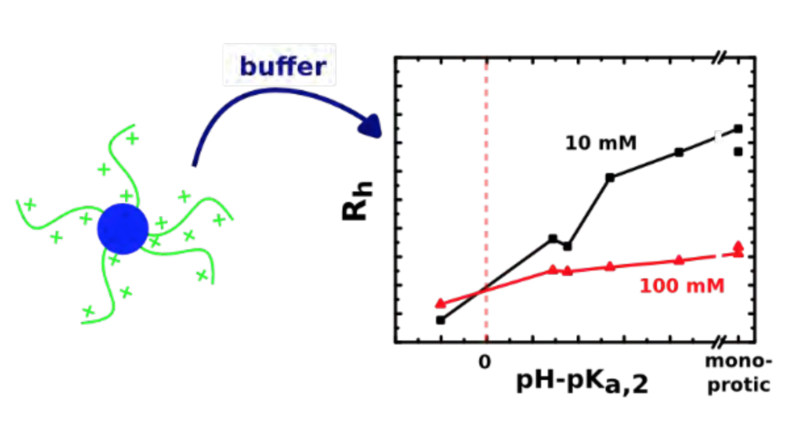 About the figure: Change in polycationic micelle size with pH in different polyprotic buffers; hydrodyamic radius Rh measured by dynamic light scattering. Reference: J.E. Laaser, Y. Jiang, D. Sprouse, T.M. Reineke, T.P. Lodge, Macromolecules, 2015, 48, 2677-2685. Charged nanoparticles, such as polyelectrolyte micelles, are of increasing interest in diverse applications, including gene therapy. The dimensions of these objects are critical determinants of their performance, yet their size is affected by the surroundings. In particular, we have shown that it is not just the pH that matters, but also whether the pH is established by a monoprotic or polyprotic buffer. This can be explained by a selective partitioning of polyanions (e.g., phosphate, sulfate) into the outer region of the micelle. This effect has not been documented before, but is of direct relevance to physiological conditions, where polyanions are abundant. 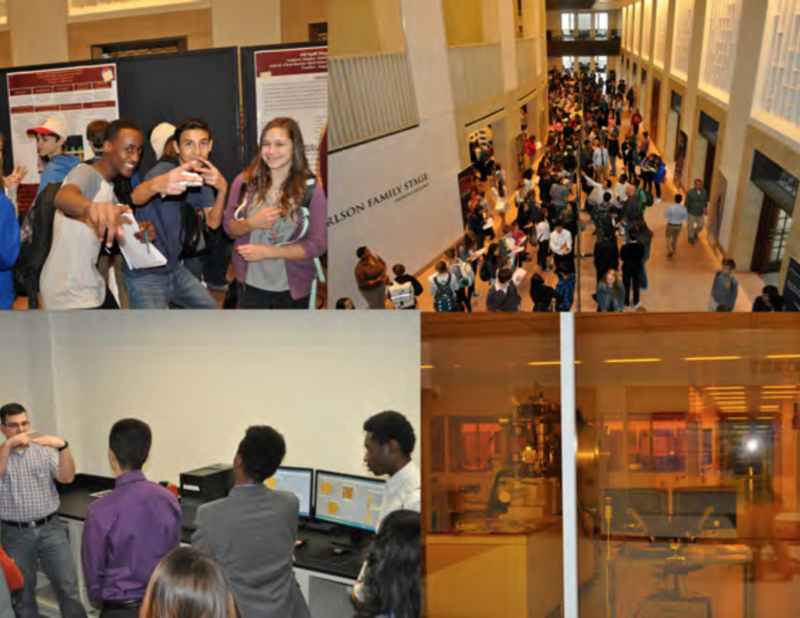 On May 20, 2015, over 250 middle and high school students participated in the inaugural MRSEC Research Experiences for Teachers Student Expo. The Expo extends the impact of the MRSEC RET program beyond participating teachers to their students via direct interaction with UMN researchers. During the school year, a secure website was set up to allow students to ask questions of the same researchers who mentored their teachers during the summer at UMN. After successful completion of the classroom research experience, the students were invited to the UMN campus to present their work in person via the Student Expo Poster Session. A full day of activities was planned leading up to the poster session, which included an admissions presentation, scientific demonstration show, and tours of the Minnesota Nano Center, Valspar Materials Lab, and seven faculty laboratories.